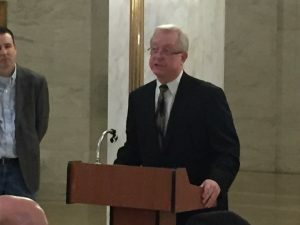 CHARLESTON, W.Va. – Industry and W.Va. legislative leaders outlined the importance of the oil and natural gas industry to West Virginia’s future during a brief press conference Monday at the Capitol rotunda. The Independent Oil and Gas Association of West Virginia (IOGAWV) hosted the event at the Legislature with IOGAWV representatives and members of the Legislature discussed issues important to the oil and natural gas industry that may be discussed during this year’s legislative session. More than 30 people gather in the lower rotunda to the hear the comments. IOGAWV Executive Director Charlie Burd provided opening remarks, highlighting the importance of oil and natural gas to West Virginia’s economy and IOGAWV’s commitment to supporting local communities. IOGAWV President Scott Freshwater added to Burd’s statements, stating the industry and legislature must work together to offer ideas and provide effective solutions to bolster the industry and state. Senate President Mitch Carmichael, House Finance Committee Chairman Eric Nelson and House Judiciary Vice Chairman Roger Hanshaw provided their thoughts and support on key issues. Sen. Carmichael stated the importance of West Virginia’s natural resources to the economy and how the Legislature must work to revitalize the energy sector. Del. Nelson echoed these statements, adding that downstream development and infrastructure also are key components to the industry’s success and are critical for job development. Sen. Carmichael is a sponsor on SB 244, which focuses on encouraging and facilitating efficient and economic development of oil and gas resources. Del. Hanshaw emphasized the importance of environmental protection while decreasing burdensome regulation on producers with tanks posing no hazards to the water supply. He also stressed the importance of leaders working to educate the public about the industry. Burd and Freshwater provided brief remarks to close the conference following the legislators’ comments.